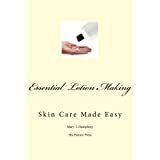 I am excited to announce the release of my new book, Advanced Soapmaking: Removing the Mystery, co-authored with Alyssa Middleton of Vintage Body Spa. 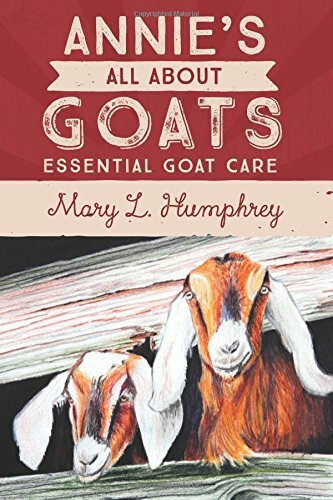 My personal goat milk soap making techniques are included in the book, as well as the formula that I follow. Goat milk soap, including most made from scratch soaps, are worth every penny you either put (or pay) into them! Learning how to make the soap yourself really does pay off – for the health of your skin! 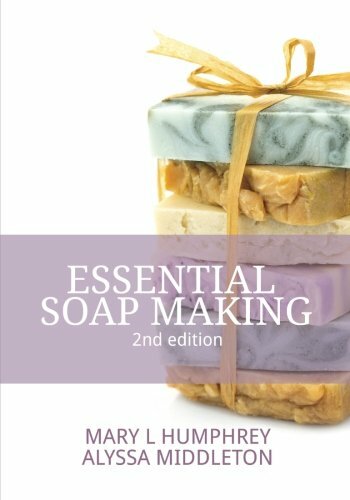 If you are new at soap making, or even if you are more experienced, I feel you will find this book to be a great resource. Happy reading, and happy soaping! 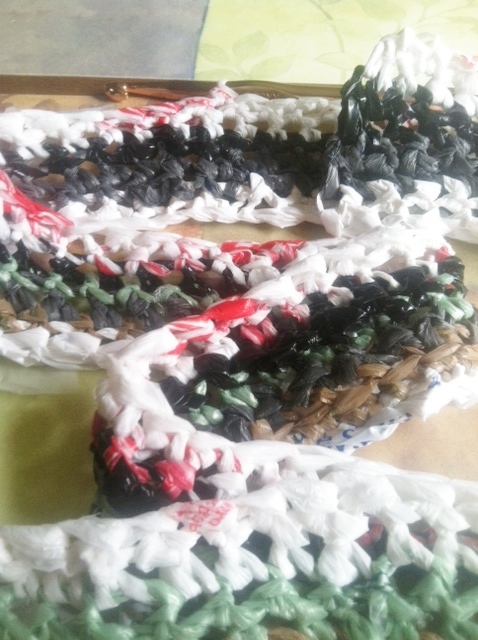 I am enthused with the early results of my latest project, a crocheted outdoor mat made solely from recycled plastic bags cut into strips (plarn). I’ve seen various instructions online for these types of projects, but I opted to be stubborn and begin this do-it-yourself project without a set pattern. You know how it is, instructions tend to confuse me. You too? 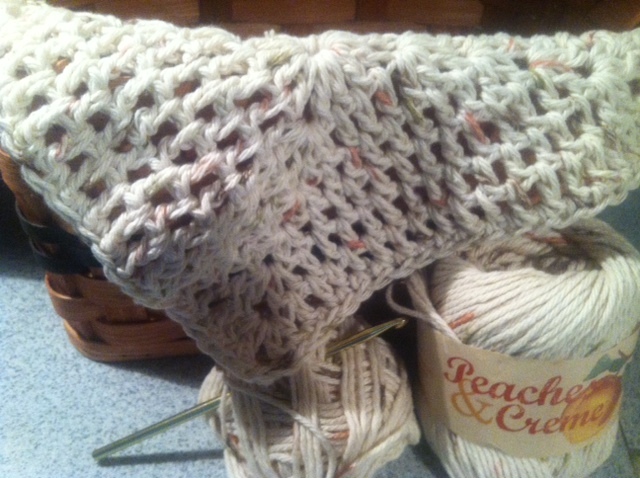 I plan to single crochet around the outer edges of the finished rug, and I might add a decorative fringe. I’ll post updates as the rug progresses. 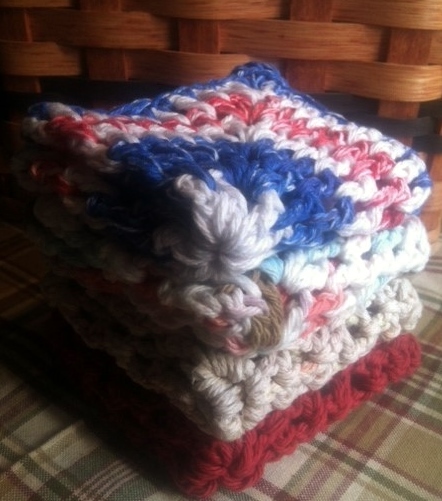 A few days ago I stared at my ragged dish cloths and contemplated purchasing new ones. I realized that I did not want just any “plain old” dish cloth. I wanted a product that was handmade, all cotton, and durable. 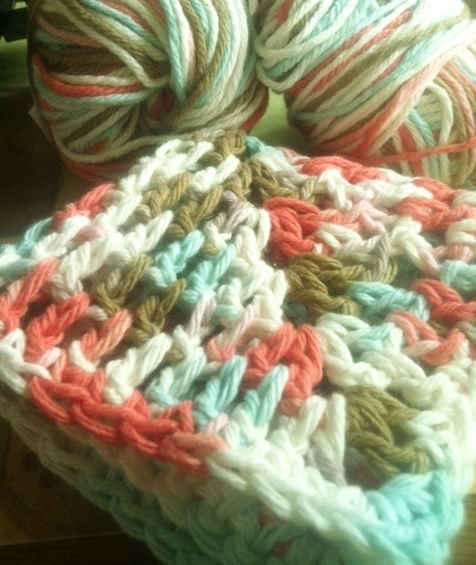 I ended up making the natural dish cloth that I wanted – just one so far. All it took was a few minutes short of an hour and the opening up of my memory banks. The real plus is that I didn’t have to pay someone to crochet the cloth for me. For those of you that make handcrafted soap, or even those that have a back-to-basic creative yearning in life, I can guarantee you these are easy to make. And if you aren’t so perfect with a crochet hook who really cares?! We’ll just call it au’ abiance! Right? Pssst…inside the paper wrapper are simple instructions. All you need to do is learn how to crochet a chain, and single and double crochets. Another pssst…I can see these as a colorful addition, in the right pattern and yarn hues, to a gift set.